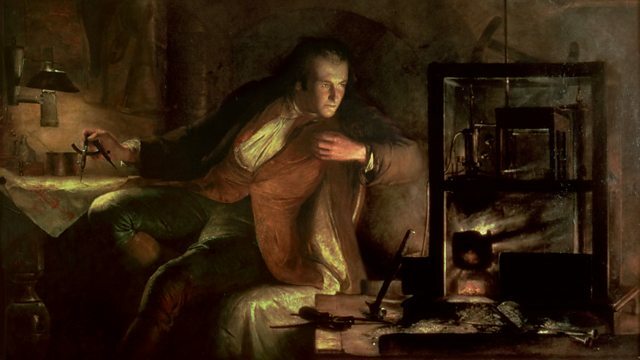 Melvyn Bragg discusses the Birmingham based society of prominent 18th century scientists, engineers and intellectuals who pioneered the science of the Enlightenment and Industrial Revolution. Melvyn Bragg and guests discuss the Lunar Society. In the late 18th century, with the ascendant British Empire centred on London, a small group of friends met at a house on the crossroads outside Birmingham and applied their minds to the problems of the age. Between them they managed to launch the Industrial Revolution, discover oxygen, harness the power of steam and pioneer the theory of evolution. They were the Lunar Society, a gathering of free and fertile minds centred on the remarkable quartet of Matthew Boulton, James Watt, Joseph Priestly and Erasmus Darwin. The potter Josiah Wedgwood, another member, summed up the ethos of this group when he said that they were ‘living in an age of miracles in which anything could be achieved’.But how did the Lunar Society operate? What was the blend of religious dissent, entrepreneurial spirit and intellectual adventure that proved so fertile and how did their discoveries permanently change the shape and character of this country?With Simon Schaffer, Reader in History and Philosophy of Science at the University of Cambridge; Jenny Uglow, Honorary Visiting Professor at the University of Warwick and author of The Lunar Men: The Friends who Made the Future; Peter Jones, Professor of French History at the University of Birmingham. Could the Birmingham Six Happen Again?